Travelers often think of Europe in terms of cities and history. Inhabited for at least 50,000 years, and industrialised for over a century, you might be forgiven for thinking it the least wild of continents. But in her less trodden corners, previously hidden behind the iron curtain, there are vast areas of wilderness and unspoiled nature. Lithuania is a country in which both nature and cultural heritage have been preserved, and each make compelling attractions for the intrepid traveller. It only take about three and a half hours to drive from one end of the country to the other (on the E85), so getting around is never too hard. The only problem is deciding which areas to visit. You will probably land in either Vilnius or Kaunas. Both cities are quite central and just a short drive from the beautiful national parks in all corners of the country. You don’t need to be able to speak Lithuanian to get by in Vilnius or Kaunas, as English is widely spoken, but out in the sticks a phrase book is useful for translation services , as it can get pretty rustic. If you’re visiting this beautiful country, then make sure you don’t miss these top 5 wild destinations of Lithuania. About a 2 hour drive North of Vilnius, Aukstaitija National Park is known as the kingdom of forests and lakes. Established in 1974, the 30,000 hectares of forest and hills contain over a thousand picturesque lakes. These are often interconnected by rivulets and streams, which can be navigated by canoe. Palushe is the ideal base camp from which to plan your excursions into the park. Other attractions in the area include the Bee-keeping Museum, the Ginuciai water mill, historic buildings in ethnographic villages and a wooden church built without using a single nail. On the Western side of Labanoras Regional Park you will find Luokesai Lake. There are numerous lakes in Labanoras, which is home to the densest population of nesting White Stork couples in Europe, but Luokesai is the most beautiful. It is frequented by the inhabitants of the nearby town of Molėtai, who love its clear water and tranquil setting. But there is more to this lake than the beauty of nature; archaeologists have discovered that the lake hides the secrets of forgotten civilisations on its bed. The lake is over 40 metres deep in parts, and for the past decade, archaeologists have been diving into its depths in order to study the Stone and Bronze Ages settlements that lurk below. The largest land dwelling wild animal in Europe is the European bison, also known as the wisent. These 3 metre long shaggy beasts resemble American Buffalo and can grow to 2 metres high, weighing over a ton. If you are very lucky, you might encounter one in the vast wilds of Lithuania, but an easier (and perhaps safer) option is the The Pašiliai wisent breeding reservoir in Panevėžys. There are 22 wisents on the 50 hectare reserve as well as an additional 50 which walk freely through the surrounding forests. The reserve was started in the late sixties, after the wisent had been extinct in Lithuania for 50 years. 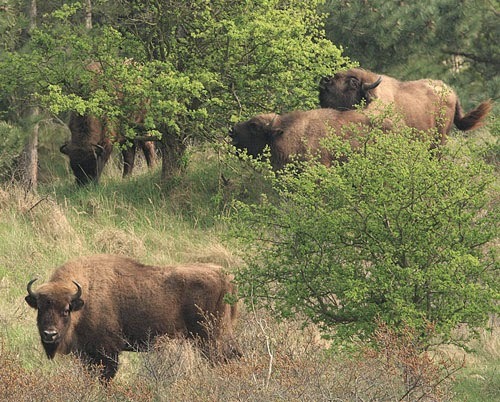 Lithuania does not have the type of huge forests required for larger herds of wisent to survive, so their numbers are controlled in this area. The Curonian Spit is a UNESCO world heritage site, sometimes described as the Sahara of the North. The narrow sandy peninsula is only 2km wide but stretches 98km and boasts huge sand dunes. The Curonian Spit has been a famous tourist destination for over a hundred years and was particularly popular with Germans in the 19th century. It was dotted with picturesque fishing villages, 10 of which are known to have been consumed by the moving dunes. The movement of the dunes has been somewhat contained due to pine forest planting in the 19th century. The lagoon side village of Neringa is the most popular resort in the area. Its lagoon coasts are lined with quaint wooden fishermen’s houses, often with thatched roofs. The fishing industry isn’t as large as it was, so most of these are now guesthouses and restaurants. Dzūkija is the biggest National Park in Lithuania. Over 90% of the 697km2 park is forested and the vast woodlands are home to an abundance of wildlife, including 54 mammal species and 198 bird species. Human population density is comparatively sparse, with only 2 people per square kilometre. Hiking, camping and kayaking are popular activities as well as berry and mushroom picking. There are 6 main walking routes and over 30 rivers and streams for kayakers. The more intrepid can drive to key locations and then explore the deep forests on foot, but be sure you don’t get lost! Tom Rowsell is a seasoned traveler, writer, film maker and nature lover from England. Great post about the attractions in Ipoh! Check out our post on the Top Things To Do In Ipoh and let us know what you think!